Towne Physical Therapy Centre is owned and directed by Mary Ann Towne, PT, DPT, MS.
Dr. Towne is the former Director of Rehabilitation and Wellness Services at Cleveland Clinic Florida and has served as team physical therapist for the Florida Panthers and the Miami Fusion. She is now the clinical director of Towne Physical Therapy Centre which was established in 2001. 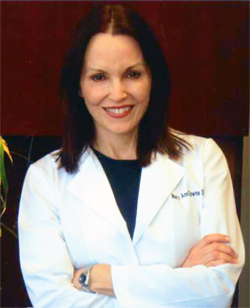 Her patients include professional athletes in hockey, football, baseball, soccer and golf; Olympic athletes in swimming, skating and diving; professional dancers; and collegiate athletes in all major sports. Dr. Towne treats patients from adolescence to geriatrics with the most comprehensive physical therapy services available. Towne Physical Therapy Centre specializes in spine, orthopaedic and sports medicine, starting with a comprehensive history and evaluation. Appropriate hands on manual therapy, stabilization and follow up self-management techniques are provided thereafter.